﻿ HuntingNut » Forums » Hunting » Varmint Hunting » YEEEEEHAWW,groundhog hunting is upon us again!! YEEEEEHAWW,groundhog hunting is upon us again!! Posted: Thu Mar 09, 2006 10:49 pm Post subject: YEEEEEHAWW,groundhog hunting is upon us again!! Starting to see lots of woodchucks around the farm I work on.Shot one each day for the last three days on my lunchbreak.All with handguns,I made a 152 yard shot one one with my new 223 barrel for my Encore(dont get too bent out of shape Bushy,I was using iron sights,no scope.Does that make it count as a handgun?HaHa). Glad to see them out and about,gives me something to shoot at! Posted: Fri Mar 10, 2006 9:56 am Post subject: Re: YEEEEEHAWW,groundhog hunting is upon us again!! Posted: Fri Mar 10, 2006 1:41 pm Post subject: Re: YEEEEEHAWW,groundhog hunting is upon us again!! Yep the gophers will be out here soon as well and I've got over 4000 rounds of 22 lr ammo and I'm ready to go. Good shooting guys, have fun. Posted: Fri Mar 10, 2006 5:55 pm Post subject: Re: YEEEEEHAWW,groundhog hunting is upon us again!! 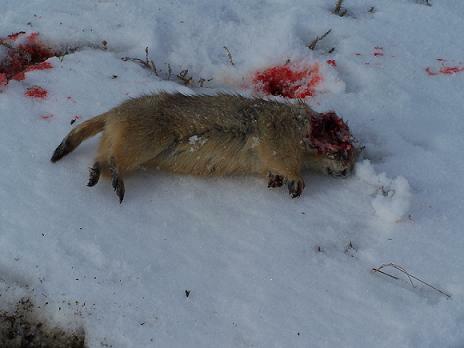 I'd love to hunt prairie dogs but they are scarce in PA,someday hopefully I will get a chance to. Nice pictures.Shot another chuck today with the Encore,184 yards(no BS, I laser ranged it).I was planning on scoping the 12" 223 barrel but am having success with the excellent TC sights,probably stick with them. Posted: Thu Mar 30, 2006 10:04 am Post subject: Re: YEEEEEHAWW,groundhog hunting is upon us again!! So, tell us what you REALLY think! Posted: Thu Mar 30, 2006 10:08 am Post subject: Re: YEEEEEHAWW,groundhog hunting is upon us again!! if you dont eat the game then its not hunting. Posted: Tue Apr 11, 2006 1:56 pm Post subject: Re: YEEEEEHAWW,groundhog hunting is upon us again!! Ground hawg is good eats! dress it like any game animal and quarter it, soak it in salt water for a few hours and put some Olive oil in a pressure cooker, brown the meat, putting on some salt and pepper, alittle Mrs Dash, when all meat is browned good put in the nesessary water seal up the pressure cooker, cook at 15 psi for 50 minutes and WOW! good grub! Serve with mashed taters and corn, and a tall cold beer. Posted: Wed Apr 12, 2006 10:20 pm Post subject: Re: YEEEEEHAWW,groundhog hunting is upon us again!! DONT FORGET TO CUT THE KERNALS FROM UNDER THE LEGS. they can give the meat a off taste. Posted: Thu Apr 13, 2006 8:07 am Post subject: Re: YEEEEEHAWW,groundhog hunting is upon us again!! I also forgot to say put about 1 large onion in the cooker with the critter. Posted: Thu Apr 13, 2006 8:27 am Post subject: Re: YEEEEEHAWW,groundhog hunting is upon us again!! 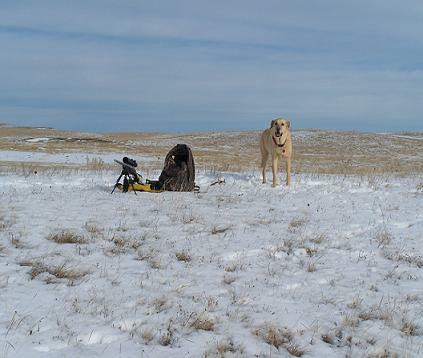 Praire dogs are coming out more...so it go time!! "Is it time to hunt yet"! Posted: Thu Apr 13, 2006 9:37 am Post subject: Re: YEEEEEHAWW,groundhog hunting is upon us again!! In mich, its red squirrel or ground hawgs. shoot!! you need to shoot about 10 red squirrels to make a good feed.